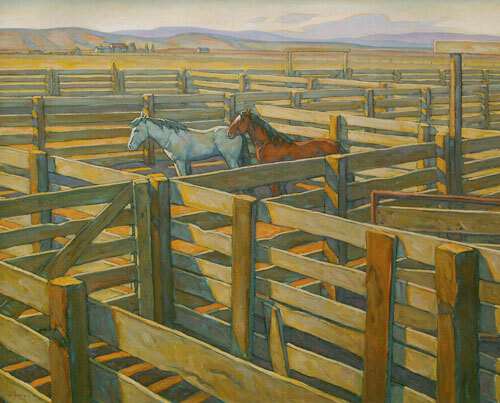 Howard Post's unique interpretation of the West is distinguished by his ability to blur the lines between contemporary and traditional Western art. A third-generation Arizonan, Post is often inspired by firsthand observation, and is subconsciously attracted to strong light sources, patterns of dark and light, horizontal lines, and canyon formations, which inform his paintings. "I don't work in a theme format or a particular preconceived direction," says Post. "I respond directly to the image I've been exposed to recently." Drawing from his personal library of thousands of reference photos, as well as his imagination, he then develops a non-descript scene of universal appeal. 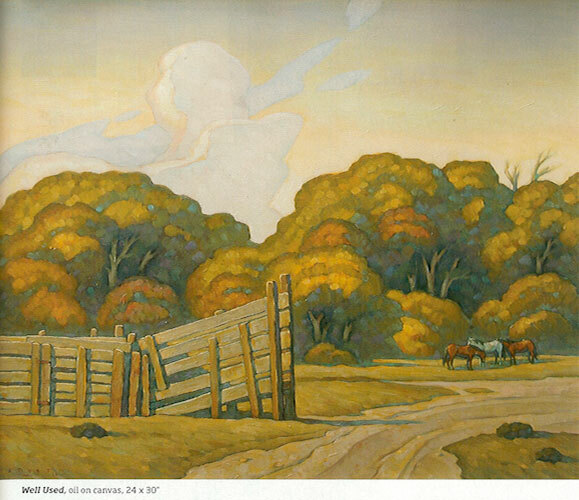 Defined by orderly, strong shapes and shadow patterns cast by the figures of cattle, cowboys, trees, or fences, such locales don't exist in reality. "I allow mysef to edit, change, or create a scene that's not truly based on that place. It almost becomes unrecognizable; you couldn't locate this specific spot," explains Post. A mainstay of Mark Sublette Medicine Man Gallery in Tucson, Arizona, Post will unveil up to 10 new works in March, a few of which were informed by recent trips to the Canyonlands and Jackson, Wyoming. An opening reception with the artist will be held Saturday, March 3, from noon to 2 pm. "Howard Post is one of the few artists I've seen that can walk the line of both contemporary and Western art and never lose his footing," says Dr. Mark Sublette, President of Medicine Man Gallery. 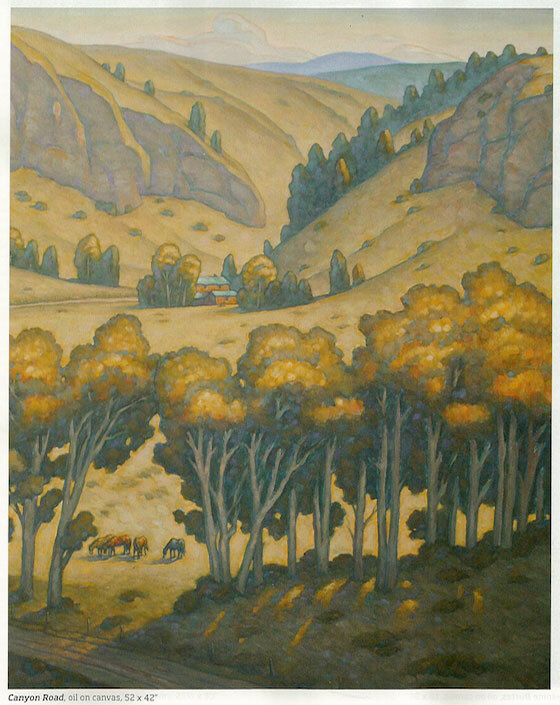 Recurring motifs of ranchsapes continue to fill each canvas, often expressed through Post's unique aerial perspective and distinct color theories. The piece titled Red and White has elements of a signature Post painting. And like a puzzle, the lines lead you back to the pair of equine in the center. "It's a different puzzle every time, so it seems fresh," he adds. Howard Post, Red and White, oil on canvas, 36"x44"
Fences frequently appear in Post's work, often adding an abstract element, which he prefers. The trees in Well Used become abstract objects as well. "I've been attracted to fences forever," he notes, "and the abandoned loading chutes here become symbols of the past." 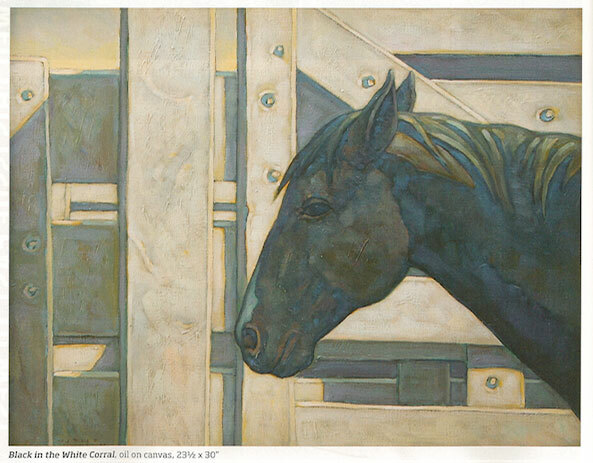 One of the artist's prized pieces, Black in the White Corral, harkens back to the 1980s when Post was commissioned to paint people's favorite horses, dogs, and even longhorns. The abstract quality, simplicity and directness combine to make this a stellar Post painting - much more than a typical animal portrait. "I love the contrast of the live object against the angular corrals, hence the title," muses Post. 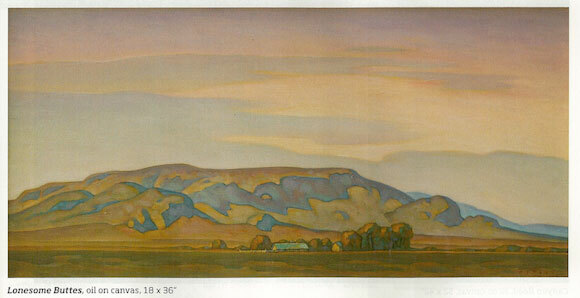 "I did a study of this piece years ago but never painted it. I finally got the buzz to paint it. It's one of my favorites." Post also likes the straightforward simplicity of Lonsome Buttes, sparked while driving the desolate roads of New Mexico. "I just try to respond to what's there and use colors that I enjoy. It's personal," says Post, adding, "I keep working trying to produce some quality art and hope it speaks to the collector, whatever the imagery is."